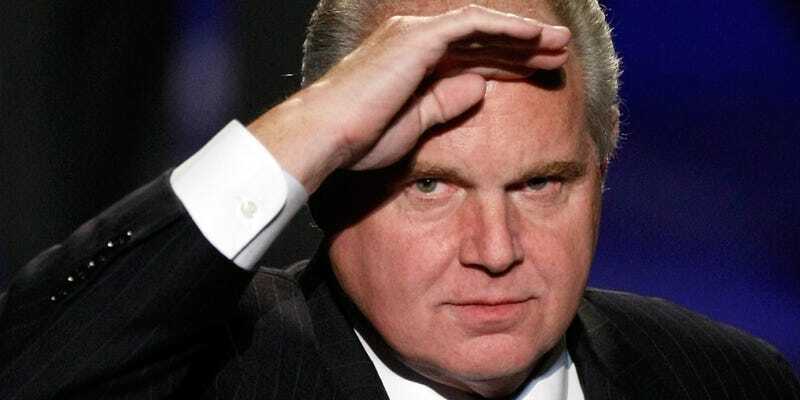 Gizmodo has confused Rush Limbaugh. Yesterday’s episode of Meanwhile in the Future was a little different from a lot of the other episodes we’ve done. Instead of exploring what a future might look like, we tackled whether a future was plausible. That future involved genetically engineering humans to reduce their carbon footprint. You can listen to the episode here. Sometimes people get confused about what Meanwhile in the Future is. Is it science fiction? Is it news? Is it a set of policy recommendations? It’s none of those things. It’s a podcast about possible futures, where we explore what would happen should those futures come to be. Often the confusion about the nature of the show plays out in the comments. Today it played out on the Rush Limbaugh show. Hey! That’s us! Here’s how he summarizes the episode. And the people at this tech blog think this is brilliant and wonderful, and they wholly endorse it. This is how deep the corruption of the leftist agenda reaches or how deep it sinks. This is evidence of just how — well, beyond corrupt — damaging this entire climate change argument happens to be, because of what the end result of it’s gonna be. The end result of it is always gonna be people supporting massively bigger and bigger government with massively more and more regulations that massively limit more and more freedom and liberty. Because it’s predicated on the fact that human beings in our natural state are destructive. Human beings as created are destroying the planet. The human engineering... One of the things that this story talks about is the human engineering that will be required to save the planet in the future is to genetically alter the human being eye so that we can all have as the primary portion of our day nighttime, and that we will need no light at nighttime. Because if we genetically alter our eyes, we’ll be able to see at night without lights and save all kinds of electricity and therefore pollute less, and therefore not destroy the planet via climate change. And this theory is wholeheartedly supported. It’s wholeheartedly endorsed. I mean, this is the kind of abject lunacy that now passes for mainstream in this argument. So, again, to set this up: NASA announces — coincidentally, timing perfect for a new movie called The Martian. It’s all the result of this stuff because what governments essentially are saying is now we gotta genetically alter human beings to be be able to see at night without lights. Our natural state as created by God destroys our planet. And do you not think it’s a little dangerous that young skulls full of mush would kind of sign on to this and believe it? Oh. Well I guess that’s an interesting way to interpret the episode! Never mind that we certainly didn’t advocate for Liao’s proposal. Never mind that we actually broke down each section of that proposal and talked about how impossible and possibly unethical it might be. Never mind that we even brought up the whole “eugenics” vibe. Or that we explicitly said “this is a road we’ve been down before, and it didn’t end well for us. So we should think carefully about this possible future.” Never mind that this is a podcast about possible futures that doesn’t advocate for any of them. All that is just details, apparently. Details that are not contained in the headline of the piece and therefore irrelevant.